Everyone has heard the phrase “dumb jock” used in reference to athletes’ performance in the classroom, but is the stereotype really true? Not according to the Los Angeles Unified School District. The LAUSD recently conducted a study that shows athletes are quite the opposite of “dumb jocks.” In fact, athletes had higher grade point averages (GPA), performed better on standardized tests, and attended school and class more often than non-athletes. Hence, if athletes are approximately 0.55 to 0.74 points higher (on a 4-point scale) in GPA than non-athletes, what factors are contributing to athletes performing better in school? Most high schools have a GPA requirement to play sports. 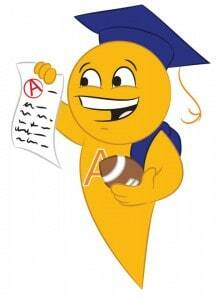 This means that athletes are forced to be more conscious of their grades than other students. During a sport season, most coaches get regular progress reports from athletes to ensure athletes will continue to be eligible to compete for their team. Some coaches even check in with athletes during the off season to keep them on the right track. Athletes cannot skip school and be allowed to play in games or practice with the team. Even if they were to try and skip school on days which they only had practice, if an athlete misses too many practices, then coaches will not play them in the next game. This leads to higher attendance rates for athletes. In fact, during the 2010–2011 school year, athletes attended school on an average of 21 days more than fellow nonathletes. That is a staggering number considering the school year is only approximately 180 days. Athletes typically start thinking about and engaging colleges at an earlier age than other students because of the nature of the recruiting process. When athletes start to contact coaches (should be during their sophomore or at the latest junior year), they get a better understanding of the requirements necessary for both college admission and those required by the NCAA. This allows them to make sure they stay on track to be admitted to the schools they want to get into. Most nonathletes start thinking about college before their senior year but don’t actually begin to communicate with admission departments until their senior year. Whether kids who play sports are drawn to them because of an inherent competitive side or they develop it over years of playing, there is no question that athletes have more competitive embers burning inside than the average person. This shows itself in the classroom, evidenced by the recent LAUSD study, but employers recognize it as well. Athletes can be more desirable in the hiring process because of the internal drive they develop throughout their playing careers along with their time management skills and work ethic. Do you have any ideas why athletes perform better in the classroom? Share them with us in the comments section below or connect with us on Facebook, Twitter, or Google+!